When parking capacity is compromised or traffic congestion is causing headaches, Professional Charter Services’ Commute To Work Program will provide you with the corporate transportation solutions you need for your business. Are your employees dependent on driving? Do your workers come from a long way away? Would they appreciate the relaxation of commuting to work without needing to be behind the wheel of a car? Your employees will love having someone else drive them to work, and they’ll get to work on time, with less hassle and stress. The Commuter Shuttle Service from Professional Charter Services is here to make you successful. We have the transportation experience to give you reliable service, and we have a great fleet of luxury coaches to ensure that your employees travel in style. We know that parking is at a premium here in San Francisco, and rush hour traffic is no fun at all. Rather than let your employees sit through traffic, struggle to find a parking place, and then have to walk a long way to the office, why not let them do their commute in comfort? Our coaches are WIFI-equipped so that your employees can even be productive on the road. Rather than spending half an hour checking email when they first arrive at the office, what if they could already have that part done when they walked in your door? Sitting in early traffic jams and trying to find a good parking spot can be stressful to deal with, especially when employees face the apprehension of reaching the office or desired location later than intended. Apart from tackling heavy traffic and competing with other drivers for parking spaces, employees want to make sure they arrive on time and ready to begin the day. The best way to ensure this happens for your employees is to opt for commuter shuttle services. Instead of having employees have to deal with the frustrating driving conditions, they can relax in the comfort of a corporate shuttle bus. Here are a few more of the benefits you can expect. By providing your employees with a commuter shuttle bus, you take a significant amount of stress and hassle away from your employees. Plus, you help them optimize their time. Since employees are no longer driving to work themselves, they can spend the time during the commute to relax, respond to emails, and prepare for the upcoming workday. By the time they arrive at the destination, they are all ready to immediately dive into their day. In most cities, people can easily hop in their car and drive to their place of work. However, in larger and busier cities, such as San Francisco, driving a personal vehicle is not as easy. With heavy traffic, the battle for parking spaces, and other frustrations, employees driving their own vehicles to work takes more time than what’s bearable for most. Intercampus shuttle buses, however, offer a solution to transport between sites conveniently with much faster commuting times compared to driving. 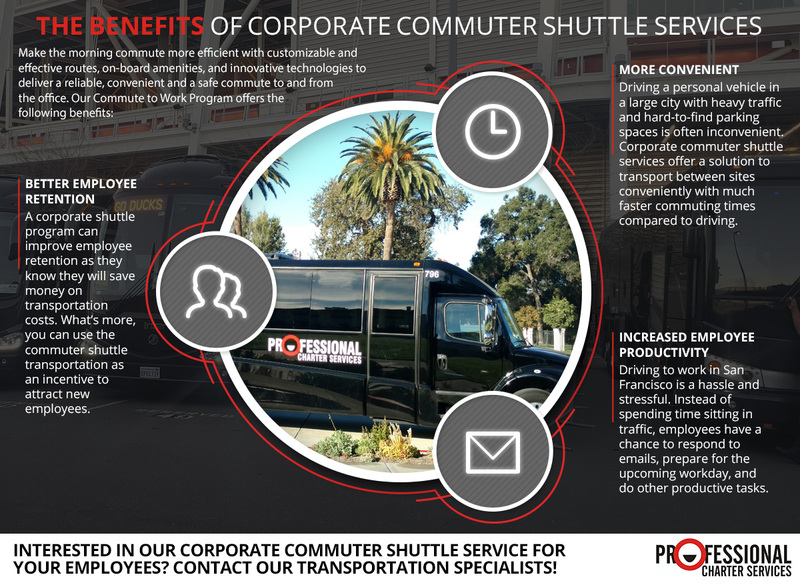 Corporate commuter shuttle services typically experience a lower count of employee absent days. Commuting through heavy traffic of large and popular cities is a hassle that nobody wants to deal with. So, by providing an alternative transportation option, employees are more likely to come to the office, even on the days when they aren’t feeling their best. Employees are much more likely to stay with your company if you offer corporate commuter shuttles to transport them to and from work. Of course, employees are concerned with other factors of a job besides commuting, but considering how difficult it is in today’s competitive market to retain good employees, you wouldn’t want to miss out on an opportunity that helps you keep the best talent. What’s more, you can use the commuter shuttle transportation as an incentive to attract new employees. Getting started with our Corporate Commuter Shuttle Service is simple. All you have to do is pick up the phone and give us a call. When you speak with one of our transportation experts, we will listen to your needs, share our expertise with you, and ensure that you get a solution that works for you, your employees, and your budget.